“The Cottage” is a sweet oceanfront ready to welcome your family to the Outer Banks! Great ocean views await you from the great room and screened porch of this pretty cottage by the sea. Located just north of the Avalon Pier, you can laze on the beach or try your hand at bringing the catch of the day home for dinner! Quaint and cute, this comfortable cottage has some nice updates and traditional treasures to make you feel right at home. Just off the great room the large screened porch has a big picnic table and great ocean views leading to the dune top deck and steps to the beach. A new generation has taken over this lovely vacation property and updated with new king bed in the master, new flooring in the great room, a kitchen with fresh white beachy cabinets, (complete with pantry) and updated bedding for everyone. Unique layout offers two separate “wings” on the ground level with bedrooms and bathrooms, for a feeling of privacy and space. Both ground level “wings” are accessible by interior stairways to the top level. All TV's are smart TVs so you can stream all your favorites. FIREPLACE IS NOT OPERATIONAL AND FOR DECORATION ONLY! 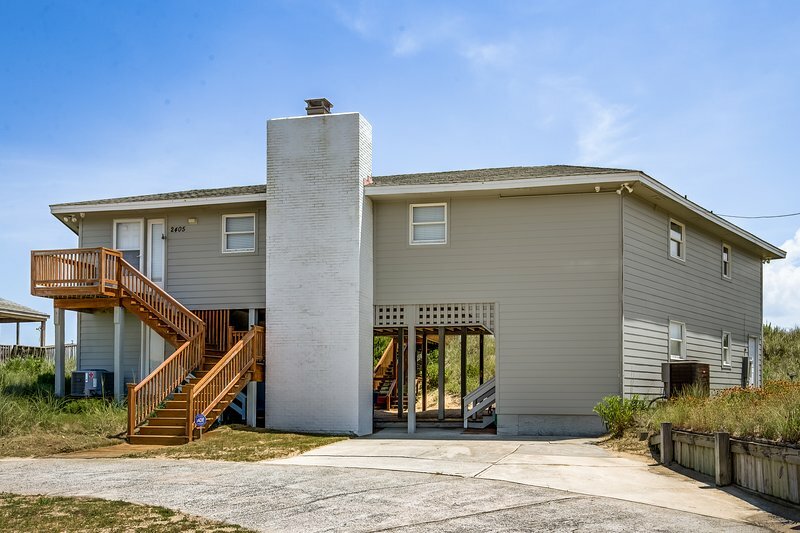 “The Cottage” is a sweet oceanfront ready to welcome your family to the Outer Banks! Great ocean views await you from the great room and screened porch of this pretty cottage by the sea. Located just north of the Avalon Pier, you can laze on the beach or try your hand at bringing the catch of the day home for dinner! Quaint and cute, this comfortable cottage has some nice updates and traditional treasures to make you feel right at home. Just off the great room the large screened porch has a big picnic table and great ocean views leading to the dune top deck and steps to the beach. A new generation has taken over this lovely vacation property and updated with new king bed in the master, new flooring in the great room, a kitchen with fresh white beachy cabinets, (complete with pantry) and updated bedding for everyone. Unique layout offers two separate “wings” on the ground level with bedrooms and bathrooms, for a feeling of privacy and space. Both ground level “wings” are accessible by interior stairways to the top level. All TV's are smart TVs so you can stream all your favorites. FIREPLACE IS NOT OPERATIONAL AND FOR DECORATION ONLY! Top-Level: Great Room with LCD Smart TV, Dining Table seats 6, Table seats 4, Screened Porch leading to Dune Top Deck and Beach Access, Kitchen with pantry, 2 Ovens, Under Counter Icemaker, Breakfast Table seats 6, King Master with LCD Smart TV; Queen Bedroom with LCD TV; Queen Bedroom with LCD Smart TV; Hall Bathroom Ground-Level: (North) Queen Bedroom with LCD TV; Queen Bedroom with LCD Smart TV; Hall Bathroom, (South) Foyer with Full Size Refrigerator, Freezer, Washer/Dryer, Laundry Sink, Closet for Beach Items, Separate Shower Room, Queen Bedroom with Crib and LCD Smart TV, shares access to Hall Bathroom Extras: Wireless Internet Access, Screened Porch, Gas Grill, Baby Crib, Dune Top Deck, Fireplace Not Operational, No Smoking, PETS NOT ALLOWED, Parking: 6 Cars, Milepost 6 Additional amenity details: Fireplace is not operational. All Outer Banks Blue properties provide bed linens, bath towels, beds made prior to your arrival, and a starter supply of: toilet paper, bathroom soap, paper towels, and dishwater detergent. Discounted H2OBX Water Park tickets available when you book with Outer Banks Blue.